As a versatile and dynamic performer Adam is equally at home performing opera, oratorio, classical song and musical theatre. In 2013 he created the role of Gulliver in the world premiere of Orlando Gough’s opera, Imago for Glyndebourne Opera. Recent engagements include work with Iford Arts Festival, Mid Wales Opera, Welsh National Opera, Scottish Opera, Opera Holland Park, Wexford Festival Opera and a tour to New York with Glyndebourne Festival Opera. He is a frequent concert artist and popular with audiences in the UK and Europe, particularly in opera galas and as a soloist for choirs. He recently performed at Pereta Opera Festival in Italy with renowned conductor Robin Stapleton and also enjoyed a recital of contemporary compositions at the Wigmore Hall, London. Other notable concert performances include Opera Galas at Barrandov Opera, Rhosygillwen Mansion, Iford Festival Opera, Fulham Palace and Glyndebourne as well as solo recitals of Mahler’s Lieder Eines Fahrenden Gesellen and Butterworth’s moving A Shropshire Lad. His choral repertoire includes Stainer’s Crucifixion, Handel’s Messiah, Mendlesshon’s Elijah, Mozart’s Requiem, Gounod’s St Cecelia Mass, Puccini’s Messe di Gloria and Orff’s Carmina Burana amongst others. 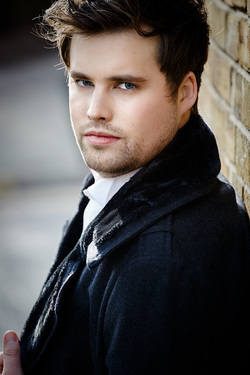 He is one of the first recipients of a Career Development Award from the Bryn Terfel Foundation and won the William Park-Jones award at the National Eisteddfod in 2014. Recent engagements include Frédéric in Lakmé as part of the Christine Collins Young Artists performance for Opera Holland Park, Escamillo in an abbreviated Welsh language production of Carmen for Opra Cymru at the National Eisteddfod of Wales and the role of Major in Scottish Opera's new production for children, KidO. Recent engagements include understudy Pish-Tush in The Mikado for Scottish Opera and understudy James in the world-premiere of Stuart MacRae's The Devil Inside, a co-production by Scottish Opera and Music Theatre Wales. Recent concert performances include the roles of Dancaïre, Morales and Zuniga in a concert performance of Carmen at the 2016 Llangollen International Musical Eisteddfod. Engagements last season include Marcello in La Bohème for Diva Opera, cover Marcello for Scottish Opera and also baritone soloist in their “Opera Highlights Tour”. Engagements this season includes cover Goryanchikov in From the House of the Dead and cover Shaklovity in Khovanshchina for Welsh National Opera and Eisenstein in Die Fledermaus for Diva Opera.